Karaoke and silly costumes… what’s not to love? 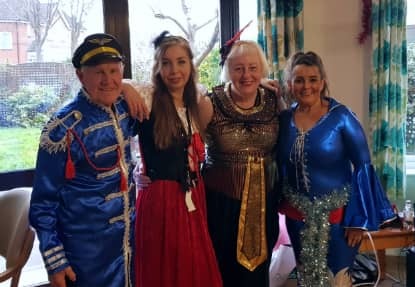 Castleford Lodge recently hosted their very own Karaoke day, complete with some fantastic costumes! Activity Coordinators Elaine, Anna, and Tracey, along with volunteer George, dressed up in some fantastically silly costumes and set out to entertain their residents in spectacular fashion. Everybody tucked into donuts and washed it all down with a refreshing glass of shandy, as they sat back, relaxed and enjoyed their afternoon of entertainment. “This will soon become a regular activity for us, everybody absolutely loved watching us get silly and it was an absolute joy to sing and dance with everyone, despite how funny we may have looked!” commented Tracey, Activity Coordinator at Castleford Lodge.